The six-time Grammy Award winners announced that their Peapod Foundation together with the Adobe Foundation will open a Peapod Adobe Youth Voices music and multimedia academy in lower Manhattan. The Peapod Foundation is the hip-hop group's charitable organisation and is administered by the Entertainment Industry Foundation. The Adobe Foundation is the philanthropic arm of software maker Adobe Systems Inc. The two foundations already run three Youth Voices academies in California - in Los Angeles, Oakland and Redwood City. 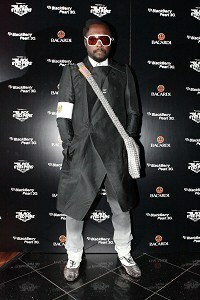 "Our passion for music and media was fuelled by many generous people on our road to success," Black Eyed Peas rapper Will.i.am said. "Expanding the network of Peapod Adobe Youth Voices academies enables us to pay it forward, giving more youth the skills and encouragement they need to realise their dreams." The academy will be housed in a facility operated by Urban Arts Partnership, which runs after-school arts programmes for teens who attend high-poverty schools.